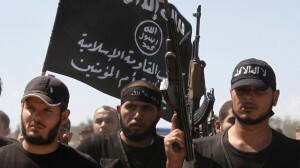 Ruthless Islamic killers fly the black flag of Jihad. “It is a vexed question, the end state,” stated Hudson Institute Senior Fellow Michael Doran concerning conflict-wracked Iraq and Syria during a March 10 Hudson Institute presentation in Washington, DC. His assessment would strike many as a dramatic understatement concerning the difficult challenges facing American policy in a murderously sectarian region discussed by him and his fellow panelists. Let’s drop the notion that defeating ISIS is our grand strategic goal in the region. Our grand strategic goal in the region is to build a new order in the region. To build a new order in the region we need partners. To get the partners we have to show that we are willing to compete with the Iranians and the Russians and that means we are also hostile to the Assad regime. It doesn’t mean we have to say regime change in Syria tomorrow, it doesn’t mean we have to drive the Russians all the way out of the region. Hudson Institute Fellow Rebeccah Heinrichs confirmed Doran’s comments on the basis of conversations with an official from an American ally in Eastern Europe. The official analyzed that the country’s policymakers “care about ISIS to the extent that the United States wants us to care about ISIS.” The country’s main strategic concern logically focused on the much more pressing and geographically immediate issue of growing Russian influence.